2018 Ford EcoSport 4WD SE, 2.0L TI-VCT GDI I-4, 6-SPD auto, automatic climate control, cold weather pkg., external keypad, remote start, Located at Maple Creek, Sk. Contact Cory or Dale at 1-877-662-2617, 306-662-2617, or email them at cpenner@cypressmotors.com or dlockard@cypressmotor.com. We Finance! On site Banking solutions! Ford Maintenance Protection Plan and Extended Ford Protect Plans available. One stop shop with sales and service. Serving Southwest, Sk. for over 45 Years. 2018 Escape SE 4WD, 1.5L EcoBoost Engine, 6-SPD Auto, Reverse Sensing System, Remote Start, Front & Rear Floor Liners, Located at Maple Creeks, Sk. contact Cory or Dale at 1-877-662-2617 or email them at cpenner@cypressmotors.com or dlockard@cypressmotors.com. We Finance! On site Banking Solutions! Ford Maintenance Protection Plan and Extended Ford Protect Plans Available One Stop Shop with Sales and Service, Serving Southwest Sk. for 45 years. 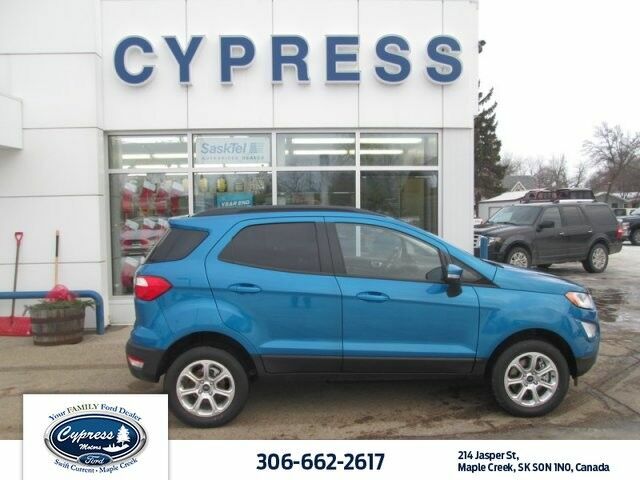 2018 EcoSport 4WD SE, 2.0L I-4, 6-SPD Auto, Navigation with 8" touchscreen, Automatic climate control, Located at Maple Creeks, Sk. contact Cory or Dale at 1-877-662-2617 or email them at cpenner@cypressmotors.com or dlockard@cypressmotors.com. We Finance! On site Banking Solutions!, One Stop Shop with Sales and Service. Serving Southwest Sk. for over 45 years. 2018 Ford Escape SE, Black Roof-Rail Crossbars, Class II Trailer Tow Pkg. '18 Escape SE 4WD, Front and Rear Floor Liners, Reverse Sensing System, Black Roof-Rail Crossbars, Remote Start, Located at Maple Creeks, Sk. contact Cory or Dale at 1-877-662-2617 or email them at cpenner@cypressmotors.com or dlockard@cypressmotors.com. We Finance! On site Banking Solutions! Ford Maintenance Protection Plan and Extended Ford Protect Plans Available. One Stop Shop with Sales and Service, Serving Southwest Sk. for over 45 years. 2018 Escape SEL 4WD, Voice Activated Touch-Screen Navigation System, Remote Start, 17" Sparkle Silver Painted Alum. Wheels, Located at Maple Creeks, Sk. contact Cory or Dale at 1-877-662-2617 or email them at cpenner@cypressmotors.com or dlockard@cypressmotors.com. We Finance! On site Banking Solutions! One Stop Shop with Sales and Service, Serving Southwest Sk. for over 45 years. 2018 Ford EcoSport 4WD SES, 2.0L T-VCT !-4 Engine, 6-SPD auto. Ebony Black Leather/Cloth Stripe STS, Cold Weather Pkg, Ext. Keypad, 17" Wheels, MoonRoof, Located at Maple Creeks, Sk. contact Russ or Dale at 1-877-662-2617 or email them at cpenner@cypressmotors.com or dlockard@cypressmotors.com. We Finance! On site Banking Solutions! One Stop Shop with Sales and Service, Serving Southwest Sk. for over 45 years. 2018 Escape SE 4WD, SE Sport Appearance Pkg., Reverse Sensing System, Front & Rear Floor Liners,Located at Maple Creeks, Sk. contact Cory or Dale at 1-877-662-2617 or email them at cpenner@cypressmotors.com or dlockard@cypressmotors.com. We Finance! On site Banking Solutions! One Stop Shop with Sales and Service, Serving Southwest Sk. for 45 years. This outstanding example of a 2018 Ford EcoSport SES is offered by Cypress Motors. This Ford includes: LIGHTNING BLUE METALLIC ENGINE: 2.0L TI-VCT GDI 4 Cylinder Engine Gasoline Fuel EBONY BLACK W/ORANGE INT, PARTIAL LEATHER-TRIMMED HEATED BUCKET SEATS EQUIPMENT GROUP 300A TRANSMISSION: 6-SPEED AUTOMATIC W/SELECTSHIFT (STD) Transmission w/Dual Shift Mode A/T 6-Speed A/T *Note - For third party subscriptions or services, please contact the dealer for more information. * Want more room? Want more style? This Ford EcoSport is the vehicle for you. This 4WD-equipped vehicle will handle majestically on any terrain and in any weather condition your may find yourself in. The benefits of driving an Four Wheel Drive vehicle, such as this FordEcoSport SES, include superior acceleration, improved steering, and increased traction and stability. Added comfort with contemporary style is the leather interior to heighten the quality and craftsmanship for the Ford EcoSport This Ford EcoSport is equipped with navigation, so you no longer have to wonder if you're headed in the right direction. Contact Cypress Motors today for information on dozens of vehicles like this 2018 Ford EcoSport SES. This Ford includes: ENGINE: 2.0L TI-VCT GDI 4 Cylinder Engine Gasoline Fuel EBONY BLACK W/ORANGE INT, PARTIAL LEATHER-TRIMMED HEATED BUCKET SEATS EQUIPMENT GROUP 300A TRANSMISSION: 6-SPEED AUTOMATIC W/SELECTSHIFT (STD) Transmission w/Dual Shift Mode A/T 6-Speed A/T SMOKE METALLIC *Note - For third party subscriptions or services, please contact the dealer for more information. * Want more room? Want more style? This Ford EcoSport is the vehicle for you. Taking the road less traveled has never been more fun than with this 4WD. With improved performance, mileage and acceleration, this 2018 4WD Ford EcoSport SES is king of the off-road. This Ford EcoSport is equipped with navigation, so you no longer have to wonder if you're headed in the right direction. This 2018 Ford EcoSport SE is proudly offered by Cypress Motors This Ford includes: REMOTE START SYSTEM (DEALER INSTALLED) SE CONVENIENCE PACKAGE Blind Spot Monitor EQUIPMENT GROUP 200A MOONDUST SILVER METALLIC COLD WEATHER PACKAGE Heated Steering Wheel Heated Mirrors EBONY BLACK W/UNIQUE CLOTH HEATED BUCKET SEATS EBONY BLACK, UNIQUE CLOTH HEATED BUCKET SEATS TRANSMISSION: 6-SPEED AUTOMATIC W/SELECTSHIFT (STD) Transmission w/Dual Shift Mode A/T 6-Speed A/T ENGINE: 2.0L TI-VCT GDI 4 Cylinder Engine Gasoline Fuel *Note - For third party subscriptions or services, please contact the dealer for more information. * Want more room? Want more style? This Ford EcoSport is the vehicle for you. Simply put, this Four Wheel Drive is engineered with higher standards. Enjoy improved steering, superior acceleration, and increased stability and safety while driving this 4WD Ford EcoSport SE. The 2018 Ford exterior is finished in a breathtaking Moondust Silver Metallic, while being complemented by such a gorgeous Ebony Black interior. This color combination is stunning and absolutely beautiful! This outstanding example of a 2018 Ford Escape SE is offered by Cypress Motors. This Ford includes: SE SYNC PACKAGE Smart Device Integration Telematics Auxiliary Audio Input MP3 Player MEDIUM LIGHT STONE, HEATED CLOTH FRONT BUCKET SEATS Cloth Seats Rear Bench Seat Power Driver Seat Heated Front Seat(s) Pass-Through Rear Seat Bucket Seats TRANSMISSION: 6-SPEED AUTOMATIC W/SELECTSHIFT (STD) Transmission w/Dual Shift Mode A/T 6-Speed A/T SHADOW BLACK EQUIPMENT GROUP 200A ENGINE: 1.5L ECOBOOST 4 Cylinder Engine Transmission w/Dual Shift Mode Gasoline Fuel Turbocharged *Note - For third party subscriptions or services, please contact the dealer for more information. * Want more room? Want more style? This Ford Escape is the vehicle for you. This Ford Escape SE comes equipped with 4 wheel drive, which means no limitations as to how or where you can drive. Different terrains and varying weather conditions will have no effect as to how this vehicle performs. The Ford Escape SE will provide you with everything you have always wanted in a car -- Quality, Reliability, and Character. This 2018 Ford EcoSport Titanium is proudly offered by Cypress Motors This Ford includes: KEYLESS-ENTRY KEYPAD (DEALER INSTALLED) EBONY BLACK, PERFORATED LEATHER-TRIMMED HEATED BUCKET SEATS EQUIPMENT GROUP 400A ENGINE: 2.0L TI-VCT GDI 4 Cylinder Engine Gasoline Fuel TRANSMISSION: 6-SPEED AUTOMATIC W/SELECTSHIFT (STD) Transmission w/Dual Shift Mode A/T 6-Speed A/T DIAMOND WHITE METALLIC *Note - For third party subscriptions or services, please contact the dealer for more information. * Want more room? Want more style? This Ford EcoSport is the vehicle for you. Take home this Ford EcoSport Titanium, and you will have the power of 4WD. It's a great feature when you need to drive over tricky terrain or through inclement weather. Added comfort with contemporary style is the leather interior to heighten the quality and craftsmanship for the Ford EcoSport Enjoy the drive without worrying about directions thanks to the built-in navigation system. Contact Cypress Motors today for information on dozens of vehicles like this 2018 Ford EcoSport SE. This Ford includes: REMOTE START SYSTEM (DEALER INSTALLED) FR & RR MUD FLAPS/SPLASH GUARDS (DEALER INSTALLED) RUBY RED METALLIC TINTED CLEARCOAT WHEELS: 17" PAINTED MACHINED ALUMINUM SE CONVENIENCE PACKAGE Blind Spot Monitor EQUIPMENT GROUP 200A COLD WEATHER PACKAGE Heated Steering Wheel Heated Mirrors KEYLESS-ENTRY KEYPAD (DEALER INSTALLED) EBONY BLACK, UNIQUE CLOTH HEATED BUCKET SEATS TRANSMISSION: 6-SPEED AUTOMATIC W/SELECTSHIFT (STD) Transmission w/Dual Shift Mode A/T 6-Speed A/T ENGINE: 2.0L TI-VCT GDI 4 Cylinder Engine Gasoline Fuel *Note - For third party subscriptions or services, please contact the dealer for more information. * Want more room? Want more style? This Ford EcoSport is the vehicle for you. Handle any terrain with ease thanks to this grippy 4WD. Whether you're on a slick pavement or exploring the back country, you'll be able to do it with confidence. Contact Cypress Motors today for information on dozens of vehicles like this 2019 Ford EcoSport SES. This Ford includes: EBONY BLACK, ACTIVEX SEATING MATERIAL HEATED BUCKET SEATS Cloth Seats Power Driver Seat Heated Front Seat(s) Leather Seats Driver Adjustable Lumbar Bucket Seats ENGINE: 2.0L TI-VCT GDI 4 Cylinder Engine Gasoline Fuel TRANSMISSION: 6-SPEED AUTOMATIC W/SELECTSHIFT (STD) Transmission w/Dual Shift Mode A/T 6-Speed A/T LIGHTNING BLUE METALLIC REMOTE START SYSTEM (DEALER INSTALLED) Remote Engine Start EQUIPMENT GROUP 300A KEYLESS-ENTRY KEYPAD (DEALER INSTALLED) Power Door Locks Keyless Entry *Note - For third party subscriptions or services, please contact the dealer for more information. * Want more room? Want more style? This Ford EcoSport is the vehicle for you. Equipped with 4WD, this Ford EcoSport gives you added confidence to tackle the surface of any path you take. Marked by excellent quality and features with unmistakable refined leather interior that added value and class to the Ford EcoSport This Ford EcoSport is equipped with navigation, so you no longer have to wonder if you're headed in the right direction. Contact Cypress Motors today for information on dozens of vehicles like this 2019 Ford Escape SE. This Ford includes: REVERSE SENSING SYSTEM Rear Parking Aid EQUIPMENT GROUP 200A ENGINE: 1.5L ECOBOOST 4 Cylinder Engine Gasoline Fuel Turbocharged CHROMITE GRAY/CHARCOAL, HEATED UNIQUE CLOTH FRONT BUCKET SEATS Cloth Seats Power Driver Seat Heated Front Seat(s) Bucket Seats TRANSMISSION: 6-SPEED AUTOMATIC W/SELECTSHIFT (STD) Transmission w/Dual Shift Mode A/T 6-Speed A/T MAGNETIC *Note - For third party subscriptions or services, please contact the dealer for more information. * Want more room? Want more style? This Ford Escape is the vehicle for you. This vehicle comes with 4WD for better traction on unstable surfaces, like snow and dirt to give you the edge over anything you might encounter on the road. There is no reason why you shouldn't buy this Ford Escape SE. It is incomparable for the price and quality. This 2019 Ford Escape SE is proudly offered by Cypress Motors This Ford includes: REVERSE SENSING SYSTEM Rear Parking Aid EQUIPMENT GROUP 200A LIGHTNING BLUE ENGINE: 1.5L ECOBOOST 4 Cylinder Engine Gasoline Fuel Turbocharged CHROMITE GRAY/CHARCOAL, HEATED UNIQUE CLOTH FRONT BUCKET SEATS Cloth Seats Power Driver Seat Heated Front Seat(s) Bucket Seats TRANSMISSION: 6-SPEED AUTOMATIC W/SELECTSHIFT (STD) Transmission w/Dual Shift Mode A/T 6-Speed A/T *Note - For third party subscriptions or services, please contact the dealer for more information. * Want more room? Want more style? This Ford Escape is the vehicle for you. This 4WD-equipped vehicle will handle majestically on any terrain and in any weather condition your may find yourself in. The benefits of driving an Four Wheel Drive vehicle, such as this FordEscape SE, include superior acceleration, improved steering, and increased traction and stability. This is the one. Just what you've been looking for. This 2019 Escape 4DR SE AWD Series is located in Maple Creek, Sk. Option on this unit are 1.5L EcoBoost engine, 6-SPD auto trans. with select shift, front and rear floor liners, reverse sensing system, and much more. Located at Maple Creek, SK., Contact Cory Or Dale at 1-877-662-2617, 306-662-2617, or email them at cpenner@cypressmotors.com or dlockard@cypressmotor.com . We Finance! On site banking solutions! Ford Maintenance Protection Plan and Extended Ford Protect Plans available. One stop shop with sales and service. Serving Southwest, SK. For 45 years. This outstanding example of a 2019 Ford Escape SEL is offered by Cypress Motors. This Ford includes: FRONT & REAR FLOOR LINERS Floor Mats ENGINE: 1.5L ECOBOOST 4 Cylinder Engine Gasoline Fuel Turbocharged CHARCOAL BLACK, HEATED ACTIVEX MATERIAL/SALERNO FRT BUCKET SEATS Power Driver Seat Premium Synthetic Seats Bucket Seats TRANSMISSION: 6-SPEED AUTOMATIC W/SELECTSHIFT (STD) Transmission w/Dual Shift Mode A/T 6-Speed A/T MAGNETIC EQUIPMENT GROUP 300A *Note - For third party subscriptions or services, please contact the dealer for more information. * Want more room? Want more style? This Ford Escape is the vehicle for you. Want to brave the road less traveled? You'll have the 4WD capabilities to do it with this vehicle. You can finally stop searching... You've found the one you've been looking for. Contact Cypress Motors today for information on dozens of vehicles like this 2019 Ford Escape SEL. This Ford includes: ENGINE: 1.5L ECOBOOST 4 Cylinder Engine Gasoline Fuel Turbocharged TRANSMISSION: 6-SPEED AUTOMATIC W/SELECTSHIFT (STD) Transmission w/Dual Shift Mode A/T 6-Speed A/T SEL SPORT APPEARANCE PACKAGE Tires - Front Performance Aluminum Wheels Floor Mats Tires - Rear Performance *Note - For third party subscriptions or services, please contact the dealer for more information. * Want more room? Want more style? This Ford Escape is the vehicle for you. Simply put, this Four Wheel Drive is engineered with higher standards. Enjoy improved steering, superior acceleration, and increased stability and safety while driving this 4WD Ford Escape SEL. This is about the time when you're saying it is too good to be true, and let us be the one's to tell you, it is absolutely true.